Feb. 22, 2007 - The Walt Disney Company today announced the long-awaited expansion of the Disney Cruise Line. In a press release, company President and CEO Bob Iger announced that the company has signed a letter of intent with Meyer Werft Shipyards of Germany to build two, 122,000-ton ships, each with room for 4,000 guests (Disney's current ships are each 83,000-ton/2,400 guests). The first of the two, as yet unnamed ships will be delivered in 2011, and the second will arrive in 2012. Few additional details are available at this time. The ships will each have 1,250 staterooms (up from 877 - a 40% increase), they'll be two decks taller, and Disney intends to follow the same design traditions as before - gold scrollwork at the bow, the existing Disney Cruise Line color scheme, and "classic" ship style. Artist's renderings of the new ships look remarkably similar to the existing ships, with the addition of two additional stateroom decks in the area between the lifeboat deck (deck 4) and the main recreation deck (deck 11) - lots more rooms with verandahs! There is no word yet on proposed itineraries. Meyer Werft Shipyards have been around for nearly as long as the U.S.A. (1795). They've built ships for many of the world's largest cruise lines, although they haven't been part of the mega-ship building explosion of recent years. To date, they've delivered cruise ships of less than 100,000 GRT, closer in size to the Disney Magic and Disney Wonder, rather than behemoths like Royal Caribbean's Freedom of the Seas or Cunard's Queen Mary II. Meyer Werft has a webcam on their site, which may prove useful and fascinating when the Disney ships are being built. At the moment, Meyer Werft is building three "Solstice-class" ships for Celebrity Cruise Lines (the higher-end division of Royal Caribbean) that are of similar size and capacity to the ships Disney is ordering. The Celebrity ships will be 1,020 ft. long, 121 ft. wide, "weigh" 118,000 GRT, have 1,425 staterooms and 2,850 passengers (based on double occupancy). More than 90 percent of those will be outside staterooms, and 85 percent will have verandahs. The standard staterooms on the Celebrity ships will be 215 sq. ft., roughly equal to the current non-verandah staterooms on the Disney Magic/Wonder. The Celebrity ships are diesel/electric-powered, with Pod propulsion systems. 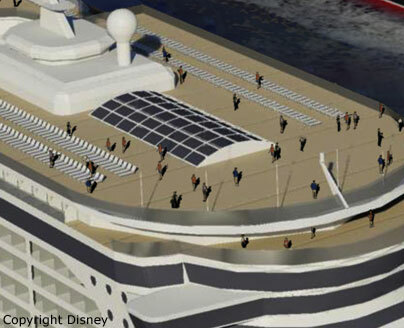 Will the Disney Ships Resemble the Celebrity "Solstice" class ships? It's not unreasonable to project that Disney's ships will be similar to the Celebrity ships. What's interesting, though, is that Celebrity is boasting how large their standard stateroom will be (215 sq. ft.). Disney's ships will be larger, but will have fewer staterooms (1,250 for Disney, 1,425 for Celebrity). While Disney isn't ready to make any boasts yet, I think we can expect Disney to announce that its new staterooms will be larger than those on the Magic/Wonder (and many other ships). It's also possible that Disney is dedicating substantially more space to its hugely popular kids programs, and to theaters big enough to satisfy guest demand (the theaters on the Magic and Wonder are often standing room-only). The other areas of under-supply/high demand on the Magic and Wonder are the number of available suites, and the difficulty of getting a table at Palo. It's not hard to guess that Disney will address both shortages in the new design. Carnival is building two 130,000 GRT, 3,652 passenger ships at Italy's Fincantieri Shipyards (birthplace of the Disney Magic and Disney Wonder), due in 2009 and 2011. Curiously, the new ships will be called Carnival Dream and Carnival Magic. No other information on dimensions is currently available. One trend is certain - the number of crew members will not increase proportionally to the number of additional guests. This has been one of the driving forces behind the mega-ship trend. There are certain economies of scale in departments like engineering, laundry, and in the kitchens, and while theaters and lounges will up-size, the number of performers and stage hands may not have to increase substantially. Most of the added crew members (and Disney has yet to announce the projected crew complement) will be stateroom attendants and dining room servers, and even there, it's likely that each will be attending to more guests than on Disney's current vessels, with various labor-saving improvements added to help them along. Will The New Ships Fit Through the Canal? It's almost certain that the ships will be "Post-Panamax" (larger than the maximum size for passage through the Panama Canal) for no better reason that the Panama Canal itself is being up-sized, with new, larger locks scheduled to enter service in 2014. The new locks will be able to handle ships up to 1,120 feet long and 161 feet wide, larger than any cruise ship that has yet been announced. None of the large ships described earlier can fit through the existing canal locks. What Port Will the Ships Call "Home?" Disney Cruise Line has been hinting the new ships are destined for the West Coast market. However... The Caribbean cruise market is #1 in the world. Would Disney Cruise Line leave its Caribbean capacity unchanged, while placing the equivalent of three Magic-sized ships on the West Coast? Probably not. I'm leaning towards a strategy that has one ship (a new one) home ported on the West Coast, with three home ported at Port Canaveral. One of those three Port Canaveral-based ships would be available for special itineraries (Mediterranean, Alaska/Hawaii, circumnavigation, etc.). Any visit by the new ships to the West Coast prior to the opening of the new Panama Canal locks will require a trip around the stormy southern tip of South America, or eastward through the Suez Canal and across the Pacific. It'd be a grand and glorious voyage in either case, but my money is on Disney assigning the Magic or Wonder to California until the Panama Canal can handle the new ships, while they plop the new boats down in the Caribbean. Will prices come down with more ships in the Disney fleet? It probably has to have some downward impact on demand-driven rates, but with no new ships for four more years, who knows how high things will go in the interim? Further, since it's highly likely that one ship will immediately move to the West Coast to satisfy demand in a huge, basically untapped cruise market that so far has been willing to pay more, not less, for a Disney Cruise Line seven nighter, there may not be all that much downward impact on Caribbean prices, even assuming the Caribbean initially gets one of the larger ships. One old ship plus one new ship in the Caribbean increases the number of Caribbean staterooms by 14% if the Magic/Wonder does the 3/4 night itineraries and the new ship does the 7-nighters, or 28% if the new ship does the 3/4 nighters. Then, how much do you want to bet that the Magic and Wonder will be taken out of service for an extended refit to bring them closer in line with the new ships' amenities? It's even possible Disney Cruise Line would stretch those ships to add additional staterooms (been done by other cruise lines). While each of those ships is offline, demand for the remaining berths remains high. The cruise industry generally recognizes that airfare is a limiting factor in people's willingness to cruise. The greater the population there is within driving distance of the pier, the more affordable cruise rates appear. That is part of the reason the rates for West Coast cruise rates have been relatively high. I'm pretty sure Disney is quite comfortable with their demand and rate projections. In the first couple of years for the new ships, I suspect repeat cruiser interest will be enough to keep the new ships quite full, no matter where they're based. Then, when you look at how little marketing money Disney currently spends on Disney Cruise Line when compared to the other major lines... all they have to do is crank-up the marketing effort a bit and they'll have all the ships bursting at the seams, as usual. In the latest (5th) edition of PassPorter's Field Guide to the Disney Cruise Line, we predicted that the new ships would be around or under 100,000 GRT, as Disney might not want to risk an over-capacity situation (leading to stateroom discounting). It seems they're being bolder than we thought. We were right that they'd probably build two ships. We were wrong about the shipyard (the two unidentified ships at Fincantieri slated for delivery in 2009 and 2010 belong to Carnival), and we are probably right about Disney going back to the design drawing board, rather than depend on designs that are by now several years old. In fact, this is all so new that Disney's current artist's renderings of the new ships can't really be trusted (a contact at Disney Cruise Line confirmed this). If you look carefully, you'll see that, with the exception of the two additional passenger decks, the design is essentially a neatened-up copy of the Magic/Wonder. You can see a glass-enclosed area in the forward section of the recreation deck (see image), presumably an indoor (or indoor/outdoor) pool. This makes sense for ships that may be visiting Alaska during the summer season. However, detailing is so sparse on those drawings that nothing should be taken at face value. While some things aren't likely to change (like the number of decks), I wouldn't place wagers on anything else at this point. Well, that's about all anybody has for now. Stay tuned for more rumors, speculation, and eventually, real news. Disney "Dreams" 122,000 GRT, length and width unknown, 1250 staterooms, 2,500 guests (double), 4,000 guests (max). Royal Caribbean Freedom class - 154,000 GRT, 1,112 ft. long, 127 ft. wide, 15 passenger decks, 1,817 staterooms - 3,634 guests (double) 4,375 guests maximum. Royal Caribbean Genesis class (fall 2009 delivery) 220,000 GRT, 1,180 ft. long, 154 ft. wide, 2,700 stateroom 5400 guests (double), 6,400 max.